Crowne Plaza Manila Galleria and Holiday Inn Manila Galleria, two iconic hotels in Ortigas Center and part of the InterContinental Hotels Group (IHG), introduce Chef Ingo Oldenburg as their new Executive Chef. Chef Ingo Oldenburg, a native of Berlin, Germany, brings with him over 20 years of experience in working with various upscale restaurants and luxury hotel brands around in Europe, Middle East and Asia. Chef Ingo will be introducing new flavors and new dishes into the menus of both hotels not only to expand the food choices, but also to create new and memorable dining experience to the guests. He also shared his love for Filipino cuisine mentioning lechon and kinilaw as some of his favorites. There is perhaps no better way to know him better than by trying some of his signature dishes. 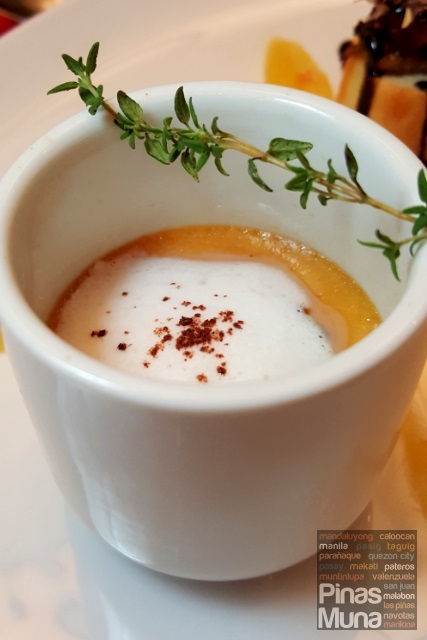 We joined Chef Ingo and our friends from Crowne Plaza Manila Galleria and Holiday Inn Manila Galleria in an intimate 5-course wine dinner to sample some of his culinary specialties. 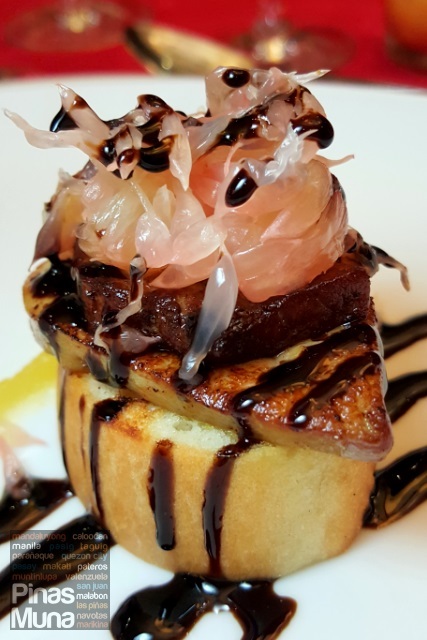 We started of with Foie Gras Duo, a pair of appetizers consisting of (left) Grilled Foie Gras served on a brioche, topped with pomelo and drizzled with balsamic reduction. The other one is Foie Gras Mocha which is cooked panna cotta style and sprinkled with cocoa. 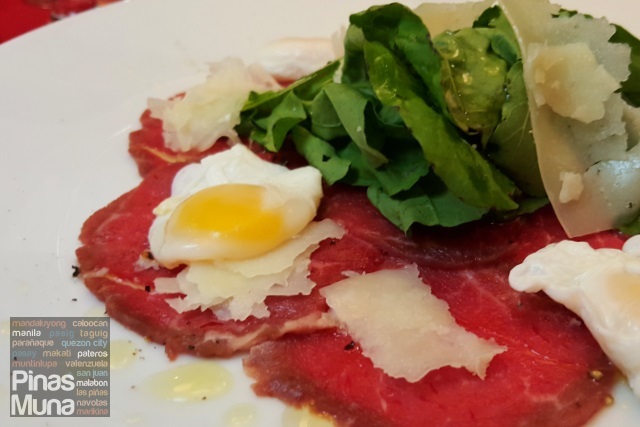 Next to be served was the Beef Carpaccio topped with arugula salad, Manchego cheese shavings, sunny side quail eggs, and drizzled with truffle oil. Adding depth to the flavor of the carpaccio are mustard and mayonnaise. The Manchego cheese added saltiness while the yolk of the quail eggs added creaminess. Finally, the arugula salad added a nutty flavor to the dish. 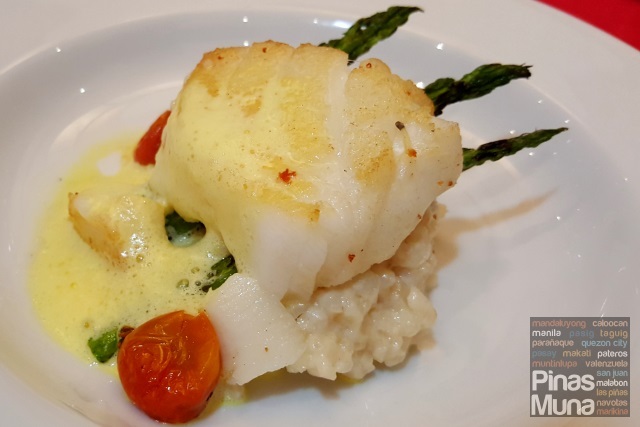 We then had Pan-Fried Black Cod which is served on a bed of creamy mushroom risotto, with asparagus tips and cherry tomatoes, and topped with saffron garlic foam. The cod was beautifully seasoned and quickly seared with light golden crust. The delicate meat of the fish was tender, moist and tasting fresh. It went perfectly well with the risotto which added mild earthy and creamy flavor. The asparagus added a nice crunch to the bite while the saffron garlic foam gave color and added flavor to the dish. This went well with the 2012 vintage Monte Blanco de Ramón Bilbao, a white wine made of Verdejo grapes grown in the Rueda wine region of Castilla y Leon, Spain. 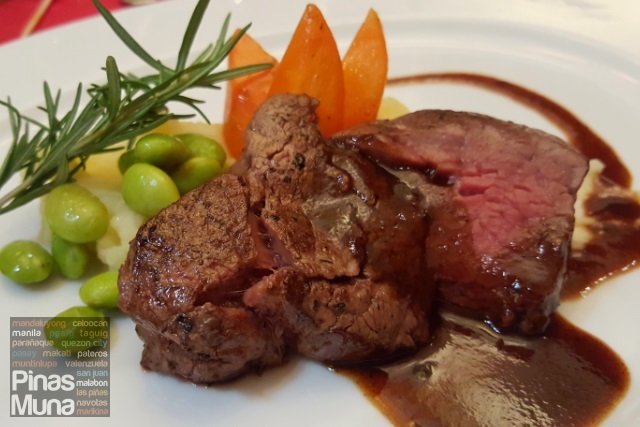 Immediately following is another main dish of Roasted US Tenderloin which is served medium-well together with buttered mashed potato, baby carrots and fava beans. The meat was tender and moist, easy to the bite. The taste is enhanced by the port wine sauce which is mildly sweet and rich in meat and herb flavors. The baby carrots were soft and sweet, and so were the fava beans. This went well with the 2009 vintage Ramón Bilbao Crianza, a red-wine originating from Rioja Alta wine region of Haro, La Rioja, Spain. 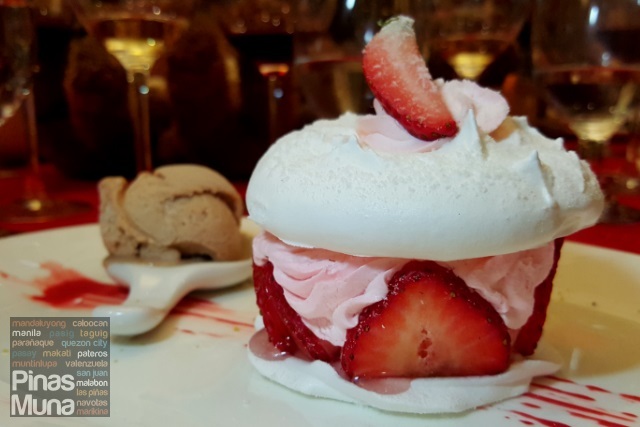 Finally for dessert, we had the Strawberry Meringue Mille Feuille and Gelato. Light strawberry cream is sandwiched between layers of crisp and delicate meringue, while slices of fresh strawberries surround the cream. The meringue wasn't too sweet and does not crumble easily. It has beautiful balance of sourness and sweetness that is delightfully refreshing. It is served with a Chocolate Ferrero Gelato freshly made in-house. It was a wonderful dinner spent with friends and colleagues in the hospitality industry. We are extremely thankful for the opportunity to sample the culinary creations of Chef Ingo Oldenburg. Vielen Dank für ein wunderbares kulinarisches Erlebnis!